This is the eighth in this series of 26 posts, one for each letter of the alphabet, that I am writing during the Blogging from A to Z Challenge, April 2016. You can find all the posts, as they are published throughout the month, by following the A-to-Z April 2016 tag. There are many excellent books and web resources covering the history of Aikido in great detail. I will list several at the end of this post. Here I’m going to give a very brief overview, and a few special bits that I find particularly interesting. During this time he also begin studying under the spiritual teacher, Onisaburo Deguchi, a leader in the Omoto religion. Deguchi had a strong influence on Ueshiba’s development of Aikido. A central teaching of Oomoto-kyo is “harmonious alignment with all life and the universe,” and this is reflected in Aikido today. “… Aikido is different from all previous martial arts. Its sole purpose is to experience universal truth in one’s own body and spirit. During World War II, Ueshiba moved to Iwama, a small, rural town, to settle down as a farmer, and soon built his own dojo there. The Iwama dojo is still active. O Sensei changed the name of his art several times, finally arriving at “Aikido” after World War II. He also changed the way of practicing the art to be safer, and accessible to more people. While some martial artists are secretive about their art, only passing it on to a select few, O Sensei purposefully promoted Aikido and encouraged teachers to spread it around the world. A few of these direct students are still teaching today, and many of their students are senior practitioners with their own dojo, continuing to pass the art along. These are some random pieces of the story of O Sensei and the history of Aikido that I personally find intriguing. Young Morihei did not care for school, and quit early. He has been described as restless. (I suspect that in our current culture he would have been diagnosed as having ADHD, and would have been medicated into compliance.) As a young man he tried his hand at a few business ventures, but that was not his thing either. In 1902, he married his childhood friend, Hatsu. When Morihei died in 1969, Hatsu died two weeks later. Ueshiba wanted to join the military, but was rejected because he was too short. To lengthen his body he hung from tree branches. It worked, and when he tried again he was accepted. Omoto-kyo, the religion O Sensei practiced, was founded by a woman, Deguchi Nao. Onisaburo Deguchi, O Sensei’s spiritual teacher, was her son-in-law. Omoto-kyo, has used and supported the language of Esperanto, which was created to help people around the world communicate more easily with each other. Ueshiba, along with Deguchi and a few others went to Manchuria and Mongolia in 1924 to spread Omoto-kyo. There they were arrested and almost executed. Over 100 others were shot, but they were released and sent back to Japan. TheFamousPeople.com provides a list of some key points in O Sensei’s life. 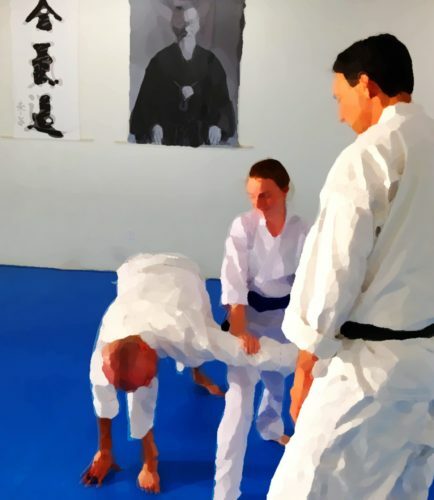 The Aikido Primer, by Eric Sotnak, gives a good overview of the history of Aikido. Aikido Club Agatsu, in Estonia, presents an excellent history, here: Morihei Ueshiba Biography and Story of the Aikido Birth. Read excerpts from Hokkaido – A History of Ethnic Transition and Development on Japan’s Northern Island, describing Morihei Ueshiba’s experiences leading a settlement there. A book about O Sensei’s spiritual teacher, The Great Onisaburo Deguchi. And of course any of the books by Morihei Ueshiba himself. I keep forgetting and remembering important events on my Aikido path, and our organization doesn’t use kyu books. So before I misplace any entirely I thought I should get them all written down in one place. What a chore! So here they are – or the ones I could think of this evening, at least, plus a few I’m planning on in the near future. I will update this post regularly, and keep a permanent link to it in the sidebar, eventually. This has a sister post now, too: My Aikido Teachers. June, 2012 Unfortunately, the Retreat is not happening in 2012. Post: How am I Limiting Myself? Several Work parties at the new and old locations. 154 total training days. Just interesting trivia. My teacher’s teacher is coming to our dojo in April. My teacher, Dave Goldberg Sensei, is a student of Robert Nadeau Shihan. Nadeau Shihan will be leading a seminar at Aikido of San Diego, April 9-11, 2010. Nadeau Shihan, 7th Dan, trained in Japan with O Sensei in the 1960s. He has been teaching Aikido since 1965. He runs two dojo: Aikido of Mountain View, and City Aikido in San Francisco. His students have included several of my favorite Aikido authors: George Leonard, Wendy Palmer, and Richard Strozzi-Heckler Sensei. He is a founder and division head (Division 3) of the California Aikido Association. It is an honor to have him come to work with us. I had the privilege of training with Nadeau Shihan last year, before I’d even tested for 6th kyu, and very much enjoy and “get” his approach to teaching. I’m really looking forward to training with him again, now that I have a tiny bit more experience and perspective. Q: What brought you to Aikido? Q: Is there something in your background that made you particularly receptive to, or inquisitive about, what has been available for you in Aikido? Q: Did you find support and validation in Aikido for who you were already, or did Aikido change you? Q: Is there something you wish you’d discovered or realized earlier in your Aikido training that would’ve helped you grow or learn? Or something you actually did discover or realize, that fundamentally changed your approach or understanding? Or perhaps is there something you hope your students can grasp (or let go of), that would help them? Is there something you see your students struggling with, that you wish they could just *get* more easily? Q: Are there activities you find to be complementary to your Aikido practice? (Meditation, gardening, …) Would you recommend them to others, or does everyone have to find their own way? Q: In your experience of the larger “I” knowing who you are (such as why you love “junk,” or love movement), were those sudden realizations, that you immediately saw (“Aha!) to be true? Or did you go through a lot of seeking and questioning before you discovered what was so for you? Q: Do you continue to make discoveries about yourself through your practice of Aikido? How has that changed over time? Q: What kind of change of consciousness, or development of consciousness, is possible through Aikido? What might that look like, in people’s lives? In a community? In the world? Q: How does Aikido work? How much is mechanics, psychology, emotion, spiritual, energetic? Or do those characterizations even make sense in the context of Aikido? Q: If Aikido is a way of helping to bring peace and happiness to the world, what is the process by which you see that happening? Q: How has Aikido changed since you first came to it? Has it expanded and strengthened? Or lost focus, gone off the tracks, or become diluted? Q: What are your hopes for the future of Aikido, and how might that future come about? Q: Do you see a correlation between the reasons people come to Aikido, and their likelihood to stay with the practice? Or maybe, does it matter why people walk through the door of the dojo, or just that they do? Q: What do you see as the best way to teach Aikido? Does the teacher convey knowledge directly, simply demonstrate, or support the student somehow in making discoveries on their own? Q: What do you see as a Sensei’s place in a student’s life? Instructor of practical skills? Role model? Spiritual guide? Counselor? Parental figure? Friend? Q: What do you hope your students (or students of Aikido in general) will get from practicing Aikido? Q: What do you hope your students (or students of Aikido in general) might contribute to Aikido? Q: How would you characterize your relationship with O Sensei? Q: Did O Sensei make requests of you (and of others, if you know), like "Go back to the U.S. and teach this”? Was he teaching his students to teach, necessarily? Q: Do you think that Aikido today is (or is becoming) what O Sensei envisioned for it? Is it growing and spreading as he’d hoped? Affecting humanity as he’d intended? Better / worse / different? Q: If you could spend an evening talking with O Sensei now, what would ask him? Or tell him? In thinking about these questions, it struck me that the world might be a much different place for many, many people, had a certain young Robert Nadeau not somehow connected with Aikido. Just another example of how one pebble can make waves affecting an entire ocean. *It occurred to me the day after posting these questions (and sending them off to Sensei) that I’d be interested in hearing others’ answers to them as well. If you teach Aikido, or have just practiced for a long time (however you define that), please feel free to copy some or all of my questions, and answer them on your own blog or Web site. I’d appreciate a mention, and please let me know where I can go to read your answers. Thanks!